This recipe a like a deconstructed salmon lox everything bagel. 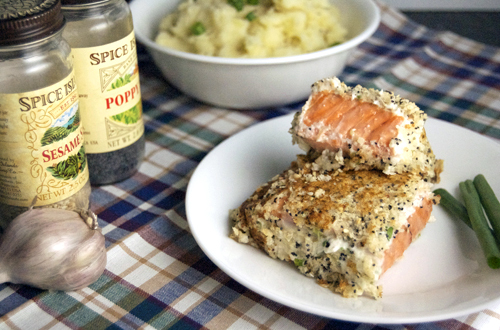 Instead of the bagel, I used panko and the everything bagel seasonings to coat a filet of salmon. In order to really get the mix to stick, I coated the salmon in a cream cheese spread. I realized after eating the dish that I am not a huge fan of everything bagel seeds haha, but besides that the flavors were delicious. You almost feel like you are eating a salmon lox everything bagel, but with extra fish which makes it less dry than a bagel. Whisk together the cream cheese, sour cream and green onions until smooth. 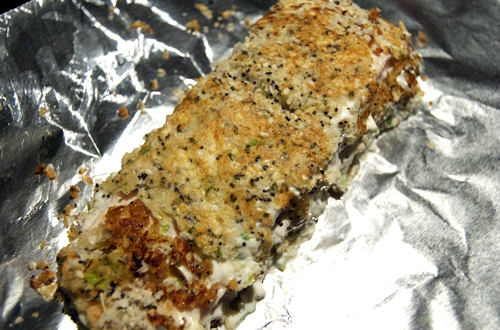 Layer each fish filet with a good amount of the cream cheese mixture until completely covered on all sides. Combine all remaining ingredients, except for cooking oil, and coat each filet with a thick layer of seasoning. Heat oil in a large skillet over medium-high heat, sear each side of the filets until golden brown (about 1-2 minutes per side). Place each filet on a foil lined baking sheet and bake at 400F until cooked through (about 8-10 minutes). I always enjoy your recipes! What a great idea! This is brilliant!!! Looks delicious…everything bagels are my favorite. Looks absolutely delicious! Well done. I really like this recipe. Great deconstruction. 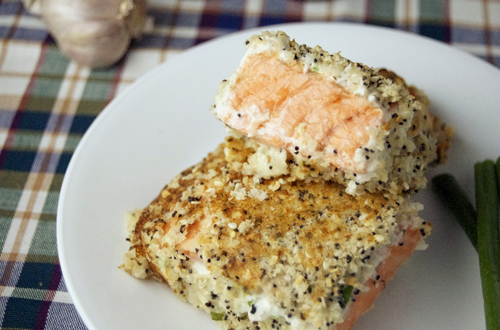 I love salmon but haven’t tried it breaded and definitely not with cream cheese as a binder. I am going to have to try this. Thanks for sharing! Nice. this looks yummy. Explain deconstruction. What a great recipe! This would be delicious with so many different proteins! That’s neat and simple. And you have two most incredible things .. salmon and bagel . That is cool! I love the idea of deconstruction, but have never quite got there…. congratulations! These look awesome! Everything bagels are totally my favorite (even better than herb and cheese, which is saying something!) and to combine those flavors with heart healthy fish….yum. Just yum. I can’t tell you how much this recipe appeals to me! Good job. I can’t eat bagels (stupid jaw) but I looove them and salmon too! This looks like the perfect solution for me! Im so excited to try it! Oh my lord!!! That sounds so amazing! I so have to try this….delicious!